To your health: Phương (right, first row) delivered free medicines on a field trip to Ea Phang in the Central Highlands province of Gia Lai. A throat affliction putting paid to her chosen vocation as a teacher, a young woman stumbles on to a new art form, courtesy some lotus flowers and a Buddhist spirit. Hồng Vân tells an inspiring story. Nguyễn Nhật Minh Phương was very clear about her choice of career. She majored in pedagogy and duly became a teacher. She loved her job. Two years ago, at the start of the 2015-2016 academic year, she found that her throat was hoarse all the time. At the hospital, she received shocking news. “They told me that I would have to undergo surgery or quit teaching, otherwise, I may not be able to speak anymore. A few months later, life sprung another surprise. Looking at the paintings, she was struck by a desire to make her own lotuses, though she’d never been an artist, never painted anything. However, she used to create small pieces of jewelry and accessories as a hobby, and a way to augment her income. A main ingredient in the accessories she was making was copper strings, and she was inspired to use them, somehow. And as soon as she started, she was hooked. For four days straight, it was all that she did. “It is hard to describe in words. I just poured all my heart and soul into ‘the painting’"
Planning it was the hardest step, she said. 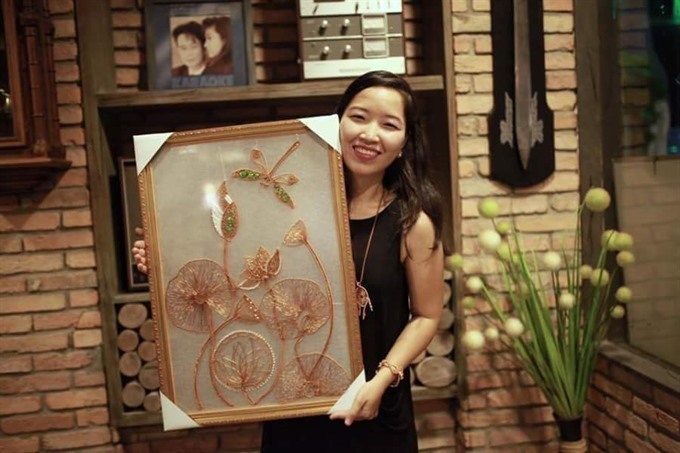 Saying it with flowers: Phương’s first work, featuring lotuses, was given to a charity organisation called “Thousand Paper Cranes” to raise funds for children. It raised VNĐ3.7 million (US$163). “As it is all about bending the copper string into shapes and objects using my imagination, I had to be meticulous and accurate,” she said. But there was divine guidance as well. “I have always been very close to Buddhism, I love the peaceful ambience of pagodas that I was taken to as a child. The lotus, a flower that my mother loves too, has special significance in Buddhism. Therefore, this flower, and later the Buddha, gave me lots of inspiration,” she said. Phương gave her first work to a charity organization called “Thousand Paper Cranes” to raise funds for children. It raised VNĐ3.7million (US$163). When she looks back to that day, she has mixed feelings. Phương does not market her accessories and paintings, and keeps things low-key, but she finds it difficult to meet demand from customers who manage to find her despite not having a website and not sharing anything on social networks. Her paintings use copper and aluminium wires without any additional colour. So her works mostly carry hues of black, pink, orange, dark brown and white. Each painting fetches around $2,000 and can go up to $4,000. Her unprecedented success has not shifted her focus from wanting to help others. 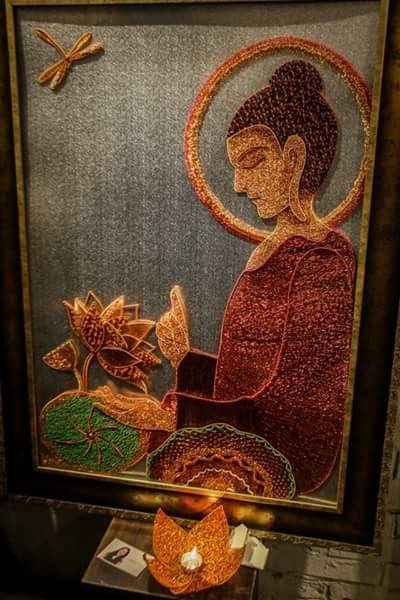 “As demand is already more than supply, I have been giving special attention to a project where I will train disabled people so that they can make these copper wire paintings and earn a living. Some investors have offered her money to develop and expand the business, but Phương has declined, wanting to reserve the skill for disadvantaged people. “People without disabilities have many more opportunities out there to work. So I will reserve this craft for those with disabilities. I will train them group by group. Those who acquire this craft can pass it down to others and gradually they will be able to have a stable life. “When our business develops more and our products reach international markets, they will realise the value. Besides the training project, Phương is also running a “Kitchen” project, in which she and her friends provide nutritious meals for children in orphanages. “Meals for these children, which is only around VNĐ5.000 (less than 25 US cents), don’t provide necessary nutrients,” said Phương. 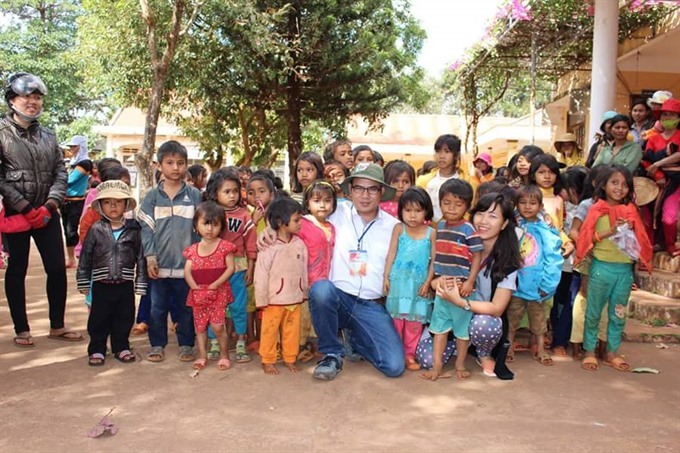 She is calling for funds for the project and has undertaken frequent travels throughout Việt Nam, mostly to remote areas in the Central Hihglands province of Đắk Lắk, Gia Lai or the northern province of Lào Cai to give poor kids commodities, talking to them and teaching them life skills. “My training and experience as a teacher gives me valuable skills for these field trips,” said Phương.